Calibration gases are widely used by an array of industrial and commercial facilities to calibrate monitors that are used to measure gases such as ammonia, methane, carbon dioxide, carbon monoxide, and dozens of other specific gases. After use, calibration gas cylinders should be properly disposed. 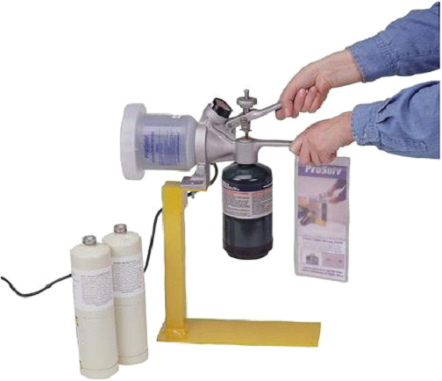 This easy to use, manually-operated venting device removes the sealing sleeve and internal valve stem from propane, mapp, and 3/4″ (1.9cm) male threaded calibration gas cylinders (not to be used with oxygen bottles). It empties and filters the propellant, taking the cylinder from a hazardous to a non-hazardous state. Rather than incurring costs associated with hazardous waste disposal, users can now recycle the cylinders as scrap steel. Using the Prosolv Recycling System can result in cost savings to businesses and as well benefiting the environment.